About a year ago, I took a foray into the world of Linux, trying to breathe new life into an old Dell desktop system. I didn't do much with it, but noted in my post the improvement in boot up speed and also the surprising ease of installation. So it was that my "test" dual boot Windows 7 & 8 laptop died leaving me with my slow "old faithful" laptop running Windows Vista. Some may wonder why haven't I upgraded this machine, after all Windows 7 would likely improve my boot time. That is certainly true, but unlike my test machine, my Vista machine is where the bodies are buried - yes, I have my iTunes / CD ripped MP3s, years of tax information, some special installs along the way like the developer's software for Android and the thought of a "do over" just doesn't thrill me. While my test laptop officially fizzled, the hard drive was still good and in this present age of identity theft, that was the one an only piece that I salvaged before selling the remainder of the laptop on Craig's List for parts. Having found myself with an extra SATA notebook hard drive presented an opportunity... maybe I could now tweak "old faithful" without having to risk the loss of my established data within Windows Vista. So I swapped out the hard drive, hunted up the Linux disk from about a year ago and went at it. Once again, the install was a breeze, taking around 10 minutes. Initially I elected to install Linux alongside (multi-boot) the "old" operating systems from my crashed test machine (Windows 7 & 8). I then timed the boot ups and was greatly disappointed with Linux Mint 9 boot up speeds of around 1 minute 15 seconds. This was not much of an improvement from my Vista boot up which hovers around 1 minute and 30 seconds. Certainly, it did not provide a compelling reason to make a permanent jump and somewhat puzzling as while "old faithful" (an HP CQ60-419WM) is running with a single core Sempron processor, it does have 3gb of RAM and certainly would seem to be a more capable machine than the extremely old Dell desktop. I theorized that maybe the multi-boot may be partially responsible (not only Windows 7 and 8, but there was also a restore sector with Vista). So I started again and reinstalled Linux, but this time selecting the entire disk. After another quick and successful install, I ran several re-boots and this time the boot ups consistently come in around 45 seconds - much better but still not terrific after being spoiled by the always ready iPad. For the record, I am writing this post while in the Linux Mint Isadora (9) operating system. I should note that this version of Linux is no longer being supported although is readily available for download online. As I indicated above, this version was selected about a year ago when I made my initial voyage in exploring Linux and I selected the version because it could easily fit onto a CD and I had (still have) many blank CDs around the house, but not so many blank DVDs. One of the first things I wanted to do was to install Chrome. I enjoy having more than one browser and thought it would be something quick and simple to do... I was wrong. Unfortunately, the latest and greatest version of Chrome would not install, throwing a "Error: Dependency is not satisfiable: gconf-service" message. I did perform a cursory search for an easy fix, but not finding one eventually stumbled on instructions on how to install "Chromium". Although I'd prefer the latest and greatest genuine Chrome, I took a cursory trial with Chromium and found it to be very good. 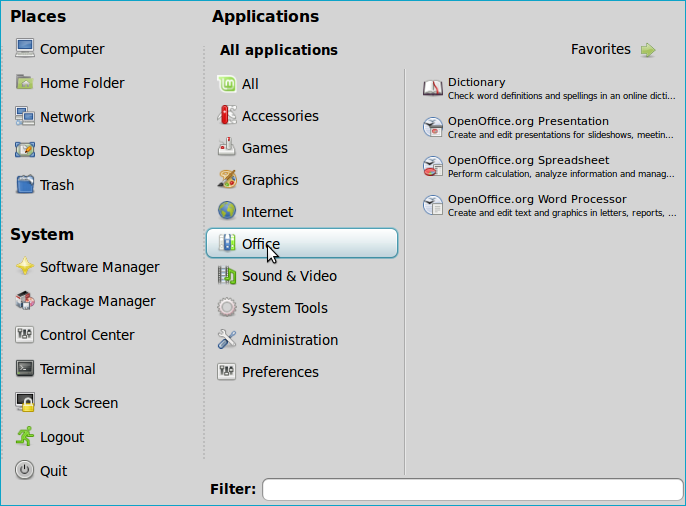 Aside from the browser bump, I was impressed with the well thought out packaging of the Isadora Linux install which included not only basic applications like a text editor and calculator but also included some Open Office applications in the install. In a recent post, I wrote about Wordpad which is a simple word processing program included with standard Windows operating system. 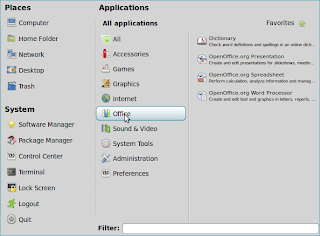 The Isadora Linux install included Open Office Word Processor, Spreadsheet and Presentation programs. Thus, this simple Linux install provides some value that is typically achieved in commercial versions requiring both the Windows operating system plus Microsoft Office. 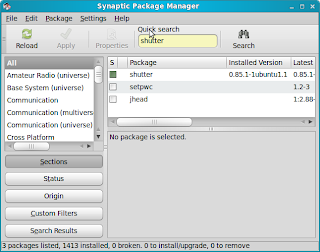 Also, included with the install is Gimp which is a widely used open source photo editing program. One thing I struggled with was finding an easy way to grab screen shots. 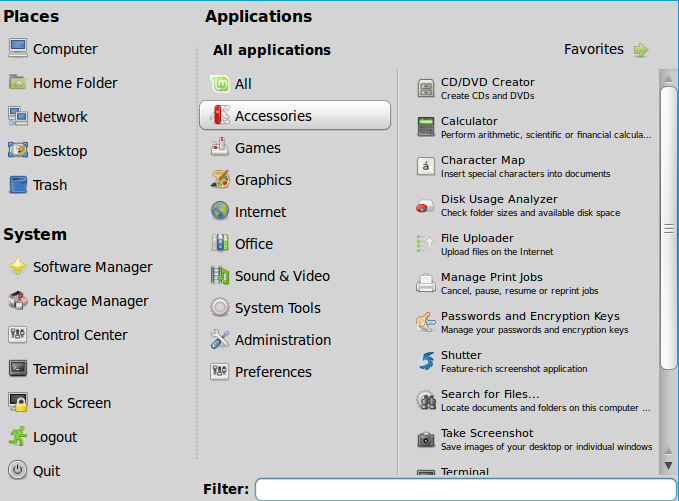 The Accessories grouping included a "Take Screenshot" program which instilled some initial optimism, but would not work to permit a nice screen shot of the "start" menu. After doing some quick Google searches, I stumbled onto Shutter. It took about 20 minutes or so of experimentation and quick Google searches to start to get the hang of Shutter. 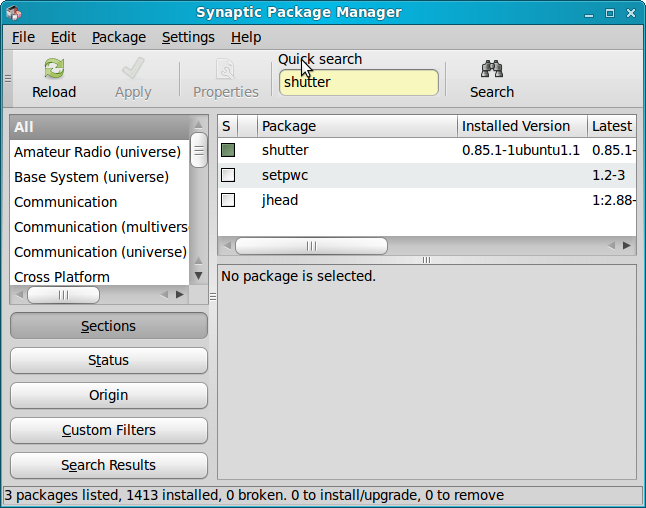 Both Shutter and Chromium were installed easily using The Synaptic Package Manager. Throughout the entire writing of this post, Linux maintained a reliable wireless internet connection as would have been managed by the Windows operating system. Improve Performance: Particularly on an old machine, this can be substantial. My boot up time on "old faithful" went from about 90 seconds with Vista to only about 45 seconds with Linux Mint (Isadora). Similar results were achieved with my old Dell desktop which had a paltry 1gb of RAM. No install disk: Yes, Windows came with your computer, but what about 2 years later when circumstances arise that you need to reinstall Windows... now where is that install disk? Did it even come with an install disk? Maybe you bought it used. Or, on many newer computers, the manufacturer is saving money by not including an install disk and instead provided you instructions on making your own install disk. You did make that install disk, didn't you? And of course, you marked each CD (x) of 10 so you know which order to install, right? Security: Windows is still the dominant operating system in the world by far. One of the problems with being number 1 is that you are also he number 1 target for malware. While I am not prepared to argue the technical merits of Windows versus iOS versus Linux, I am confident that the size of the attacks on Linux is much smaller than those targeting Windows. Travel or Spare computer: I am always amazed to see travelers traveling with high priced tech equipment such as Mac Books, the latest iPad or their high end performance Windows machine. It is not just the cost of this equipment but also the information contained on them as well as the access they may provide. If I were to loose such equipment, there would be more than a tear in my beer. Currently, you can buy a good, low end netbook or laptop on Craig's list for around $100. Then, just add Linux and you have a clean, reasonably zippy machine that won't contain your tax forms from the last 5 years or cache your Facebook log in, etc. Broad based technical knowledge: Almost everything touches technology today. The more you know, the better you position yourself for success.